Through the Ehecatl Art painting process, people gain insights into their perceptions, thoughts, and emotions by channeling spiritual information using shapes, dimensions, and colors. 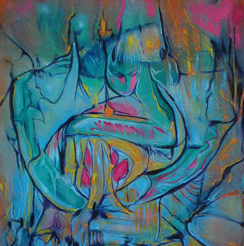 In following the Ehecatl Art process, painting is experienced as a source of insight and personal transformation. All ability levels are welcome and encouraged. It is not necessary to have experience or skill as an artist to benefit from these classes.